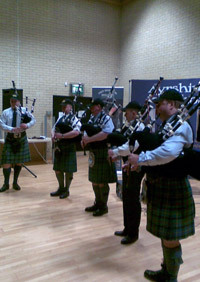 Several times a year, the McCallum Bagpipes pipers hit the recital trail with the McCallum Bagpipes Roadshow. 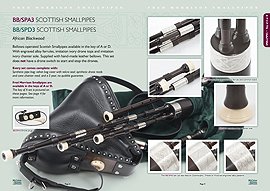 The company uses the Roadshow to showcase the quality of the products manufactured at McCallum Bagpipes as well as allowing piping audiences to hear the quality of the instruments played by some of the world’s top pipers who develop the products at our factory. The McCallum Bagpipes Roadshow recitalists are Willie McCallum, Rory Grossart, Kenny MacLeod, Stuart McCallum, Steven Leask and Sylvain Hamon. 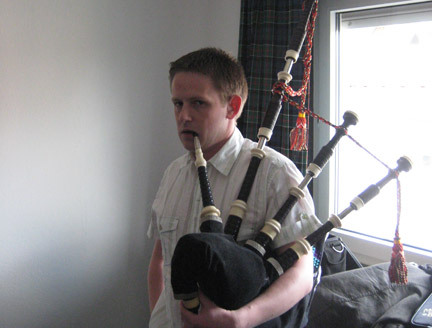 All are vastly experienced pipers and have competed at the highest level. The Master of Ceremonies is Allan Hamilton. Each Roadshow takes considerable time and effort to prepare. 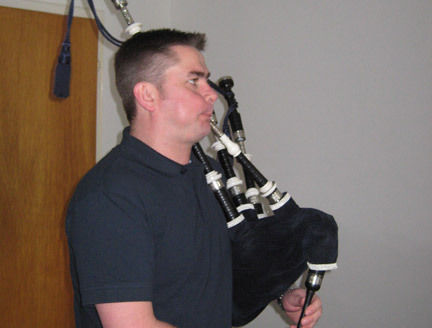 Every one of the pipers in the team maintains their instrument at the peak of perfection and they all put in many hours of practice time working on the musical content they will perform individually and collectively during a recital. Here you can see the team hard at work before a typical recital. 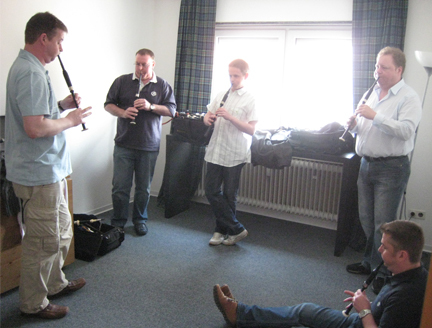 The recitalists each perform a solo set of around 20-25 minutes, followed by a smallpipe and red-pipe set with Rory and Stuart playing together with Kenny accompanying them on the bongo drums. To round off the show, the group comes together to play a set together. 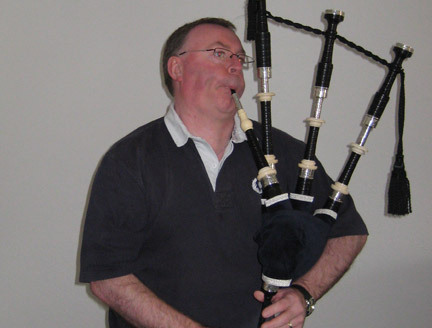 The Roadshow donates all money raised to local piping related good causes. 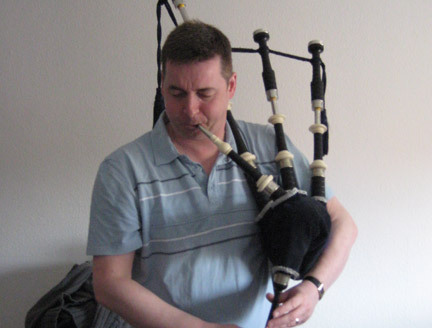 An example being the recital in Germany, where all the ticket money was given to the Bagpipe Association of Germany. This event was sold out, so a substantial donation was made to the BAG. Other beneficiaries are the North West England Piping Society, Inveraray & District Juvenile Pipe Band, Kintyre Piping Society and the Donald MacLeod Memorial Piping Competition. If you want to find out more information or are interested in bringing the McCallum Bagpipes Roadshow to your area, please contact us.